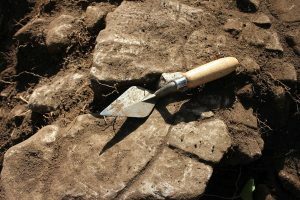 The San Diego Archaeological Center is dedicated to fulfilling the intent of the California Environmental Quality Act (CEQA) to preserve examples of the major periods of California history and to offset the impact of land development pressures on cultural resources. The Center is committed to the preservation of our archaeological legacy and serves as a curation technology resource to federal, state and local government and private companies. Click on this link for a copy of our Collections Management Policy. The Center is committed to the standards set by the Native American Graves Protection and Repatriation Act (NAGPRA) and promotes the repatriation of human remains, funerary objects, sacred objects or objects of cultural patrimony to the rightful descendant groups. Collections curated at the Center will undergo a thorough examination to confirm that the Center has not retained NAGPRA eligible items. If NAGPRA eligible items are found, the Center will contact the descendants and begin consultation and repatriation procedures. All collections accepted for curation undergo NAGPRA assessment at the Center. The Center has been guided by Native American Tribes as to what objects will be requested for repatriation. It is important that the final reports mention inadvertent finds of burials or sites of ceremonial importance so that we can be aware of the possibility that items eligible for repatriation may be in the collection.